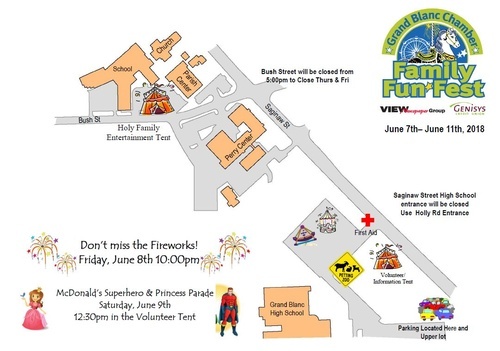 The Grand Blanc Chamber Family Fun Fest features over 22 carnival rides, elephant ears, and a beer tent. Fireworks will be on Friday night at 10:00pm. This four day event brings from 35,000 to 40,000 people who have a chance to come together for some recreational outdoor fun. This is the perfect venue to showcase your company to visitors of the Festival. The Chamber will be selling discounted tickets for day passes for the rides. $25 passes (good for one session) can be purchased for $20, and passes good for all weekend (value $125) can be purchased for $60 at the Chamber office up till Thursday, June 7th 3:00pm. ​Contact the Chamber for more information at 810-695-4222. ​GRAND BLANC HIGH SCHOOL NORTH PARKING LOT ON S. SAGINAW ST.